​The Long Island Chapter of Trout Unlimited is a group of men and women whose focus is to restore and conserve Long Island's coldwater fisheries. Our 400+ members are mostly from the Nassau & Suffolk County regions of New York. Our chapter holds regular meetings on the 3rd Tuesday of every month except July & August (we sometimes have date changes so be sure to check the calendar). We focus on important conservation issues at these meetings, and also leave some time aside at the end of our meeting to have an entertaining guest speaker. We also hold our Annual Banquet in April. We get involved in Trout in the Classroom, DEC Camps for youths, stream cleanups, resource management, fundraising campaigns, adopt a service person, and other activities which ensure healthy watersheds for our children and their children. Please visit our website periodically as we will provide continous updates about our different initiatives, offer exciting raffles, and inform you about important events. On the third Tuesday of every month except July and August, a bunch of folks head over to the VFW in Hicksville, NY, listen to what the local T.U. chapter is doing to conserve and protect, reacquaint with each other from the last meeting, sneak a donut or two, and hope that the guest speaker will either teach them a few things or tell them a few new places to fish. That’s what a membership to Trout Unlimited appears to be, however, there is so much more that one can get from their membership. So what actually is the benefit of becoming a T.U. member and attending our monthly meeting? Should you come to a meeting, you may have the opportunity to learn how to tie a Royal Wulff correctly, you'd learn about some interesting places to fish on Long Island and other places outside of our areas, you'd have a chance to win a fly rod or a box of flies in a raffle, you'd learn how to tell the difference between a blood knot and surgeon’s knot, hear an expert talk about flyfishing from a kayak, you'd certainly be asked for your help in participating in a stream cleanup or a trout stocking, you'd have an opportunity to join the Spring Banquet Committee or the Stream Improvement Committee, and most certainly you would get a free cup of coffee and a donut (or two or three)….although they are benefits, the real rewards of becoming a member of your local Trout Unlimited Chapter are knowing you are making a difference in protecting and conserving our natural resources for future generations, and getting the opportunity of meeting life long friends. Friends who you will want to spend time fishing with, friends with whom you can put your trust in, friends who are reliable, and friends who will take from their own time to help you become a better person as well as a better fisherman. Time, after all is one of our most precious resources, and when you are on the river with a buddy, and that person stops fishing, asks you to move into their spot where the fish are rising, offers you a fly that is working and takes from their own time to offer you a few tips on how to land the big fish in that pool, that’s when you know you’ve made a true friend. We need your help. Please contact one our board members, and they'll be more than happy to tell you how you can help our worthy cause. We have positions which need to be filled, as well as committees that can use your support. Every little bit helps, it really does! Research done by Tom McCoy. See his history of LI TU. "After combing through the Long Island Chapter (069) records, it appears that the chapter was first chartered in 1970, but was then disbanded due to lack of membership. The chapter was then re-started in late 1972 with Salvatore Palatucci as the chapter president. early years of the Long Island Chapter. Unfortunately we don't have the original charter document or welcome letter clarifying the dates. " 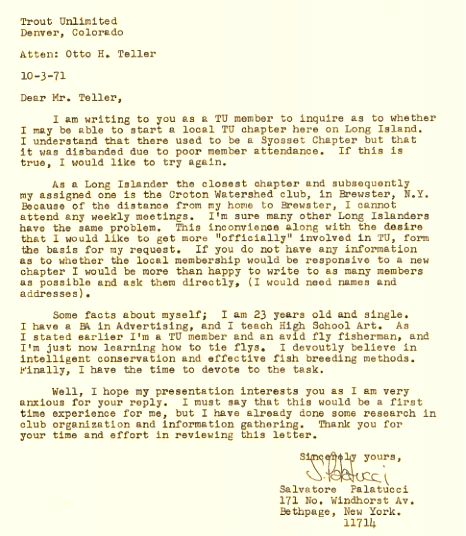 On the Occasion of the 50th Anniversary of Trout Unlimited, past board member, Tom McCoy, has compiled a historical timeline of our Chapter throughout the years. To do this, Tom interviewed some of our longstanding members, retrieved from storage all of our newsletters, consolidated notes from our scrapbook, and provided some of his own commentary. Click the link below to save the pdf of the project. Anyone wishing to contribute to this document please email Tom at tfm97@optonline.net.